Kelly M. O'Brien, By a Thread (detail). Paper, wood, paint, thread, cinder block. 110x175x10 cm | 43x69x4 inches. ©2018. I just wrapped up the 2nd term of a 2-year MFA, capping it off with an in-studio exhibition of my work and a fat research binder to back it up. The research process has been eye-opening. Early in the term, I had a plan for what I wanted to do that got slightly derailed by (in hindsight) very helpful feedback from professors. At the time, it stopped me cold for a couple of weeks. March was all about trying new things and playing with materials but not having a clear idea of where things were heading. This made me rather anxious, but I trusted the advice to 'stick with it and see what happens' and kept showing up in the studio. This was compounded by the themes I'm working with - loss, memory, home and belonging - during a time that marked the one-year anniversary of my father's death. Kelly M. O'Brien, Cherished Objects (work in progress). Paper, PVA, wax. ©2018. Once I realized I was putting too much pressure on myself to make something meaningful, I relaxed and things started to flow. I learned how to cast objects, using materials such as wax, paper, and plaster. I also made a series of small mixed media samples with materials mined from the boxes of my father‘s telecom installation business. Kelly M. O'Brien, work in progress. Found telecom components, monofilament. ©2018. April is when the breakthrough happened and things came together. Upon discovering a needle felting machine in the mixed media textiles workshop, I started to experiment with running different types of paper through the felter. 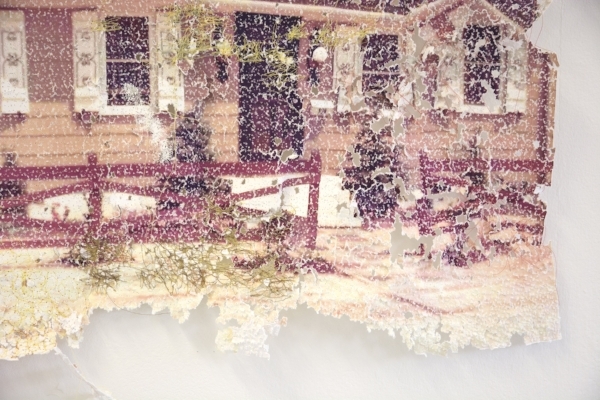 The results led to further explorations of the impact of intervening into other ephemeral materials (overstitched photographs, family snapshots, paper artefacts) to the point of obfuscation, deterioration, and complete disintegration. Kelly M. O'Brien, Object (Im)permanence, Long Beach Island. Paper, thread. ©2018. Kelly M. O'Brien, Object (Im)permanence, Long Beach Island (detail). Paper, thread. ©2018. I have been testing the limits of material and form – how opposites such as strength and delicacy, impermanence and stability, accretion and disintegration come together and fall apart – and how these paradoxes might be expressed through mixed media sculpture. How much tension can pierced paper withstand? For how long? How many times can it be repaired? Is thread adequate for the job at hand? How might qualities such as tension, failure, and imbalance impact a narrative? For our in-studio assessment exhibition, we had to curate one or more pieces that represent where we are in our practice. In addition to working with paper as the main material, I'm excited about the mixed media sculpture that is starting to emerge. May Studio Update: Manic May!